Whew! So hooking everything up wasn’t so hard, actually, although the sound gave us some trouble. First we connected the mini-DVI converter to the HDMI cable (images in part 2). 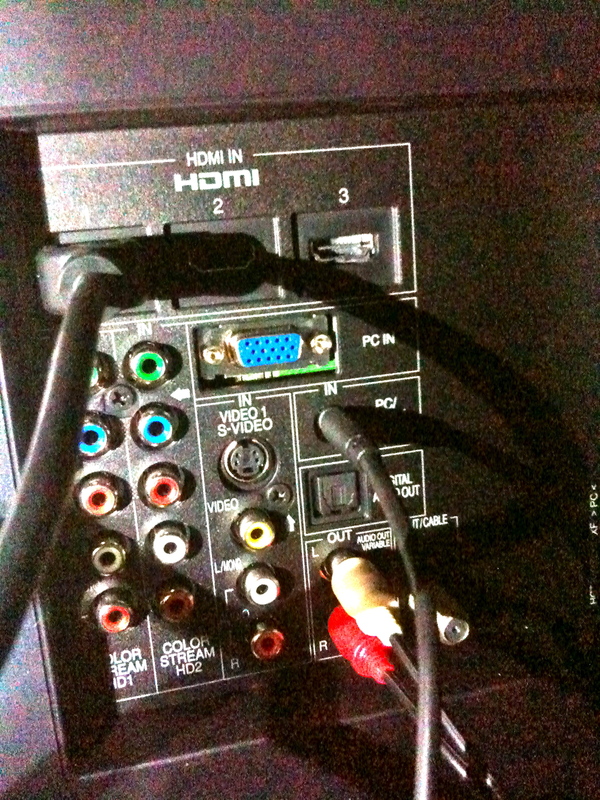 Then the computer from the mini-DVI port to the HDMI connection on the back of the television. Here’s where we ran into trouble with the sound: we had the wrong audio cable. I don’t actually understand why, but no matter which of the red & white connections we tried on the back of the TV, from the “headphone out” jack on the Mac mini, we couldn’t get sound. After too long, we realized we needed a cable with a headset jack on both ends. One end into the “headset out” on the Mac mini and the other into the “headset in” plug on the back of the TV. Finally, sound from the computer out of the TV speakers! But we also have surround sound so then we needed a cable that had the “Y” red & white connections on both ends. So, one set of red & white plugs into the “out” section (near the cable connection) on the TV, and one set into the receiver for the surround sound. Now, sound from the computer coming out of EITHER the television speakers OR the surround sound system. Success! Now, the Mac Mini doesn’t come with a keyboard or a mouse, and we certainly could have bought them, but they are expensive and I didn’t really want a keyboard & mouse in my living room. In one of the articles I listed yesterday, we learned about a free software called Teleport (free), and we installed it on both of our MacBooks. It actually works quite well to allow us to control the Mac Mini with the keyboard or trackpad on either of our MacBooks. I recommend it. I also just learned about Mobile Air Mouse Pro for iPhone which apparently will allow me to do the same thing from my iPhone, instead of having to use one of the MacBooks. Here’s a review from someone at MacWorld doing exactly this. I’m excited to try it. The only remaining problem is that the icons and words on the 40” TV screen look very tiny and are difficult to see from the couch. I just discovered these instructions and I’m hoping that they help. With the antenna and tuner we’re getting all the major network channels: ABC, CBS, NBC, FOX, and PBS. All of these seem to come in well without any adjustments to the antenna (we just have it sitting on top of the entertainment center, and it’s in the interior of the house, not near a window). We also get the CW, however we realized that we did need to adjust the antenna to get this to come in better, but with a few corrections it now seems to come in just fine. The Eye TV software plus a subscription to the online TV Guide (inside the Eye TV software, free year one, then $19.95/year) allows us to view what’s on, and record shows to watch later. However, we can only record ONE show at a time, and I haven’t seen a warning that tells me when I’ve got two shows set to record that conflict. It seems to just pick one, and we’ve missed a couple of recordings due to this. However, the network websites run many full episodes online for a period of time. Also, we CAN watch a recorded show while a live one is recording. We cancelled cable (Yay! Savings of $88/month) and have been using this set-up for about 2 weeks now, and we’re still getting used to it but it’s a surprisingly small adjustment. The next item on my agenda is to look into software that I believe will aggregate video and music from the web and stored on my hard drive and allow me to browse and select it for viewing/listening all from one place. I have learned of two: Boxee and Plex. I read another review that concluded that Plex was better, so I downloaded that. However, there is no user guide, everything is a video and the software is not intuitive. So I have not taken the time to watch the videos yet and so I haven’t figured out how to use it, so that subtracts points from Plex in my book. So far it seems to be no trouble to go to a website (Netflix, Hulu, YouTube, or a network site) to find whatever shows I want, but I do think it would be convenient to view my choices in one place. I would love to hear any comments/feedback you have on this whole experience, if you’ve done it, or if you’re planning to try it. Thanks for reading, and I hope you have found it helpful!